Another rather anaemic press release from Momentum leaves us to fill in the gaps. Entity – not to be confused with The Entity, the classy 1982 horror feature from Sidney J. Furie – is the debut feature from writer-director Steve Stone and stars Dervla Kirwan (Ballykissangel; 55 Degrees North), Charlotte Riley (The Take), Branko Tomovic (The Bourne Ultimatum) and Rupert Hill (Jamie Baldwin from Coronation Street). English language reviews are hard to come by, with the film's external reviews page on IMDb peppered with links to articles that anticipate the film's arrival but don't actually review it. 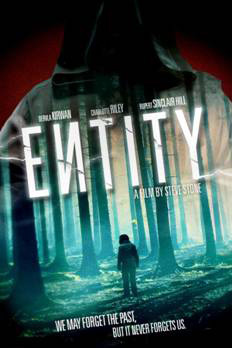 Anyway, Entity will be released on UK DVD on 24th June 2013 by Metrodome Distribution at the RRP of £15.99. No extra features are listed.